I was just wondering if Parrots can easily say a word with a f in it? 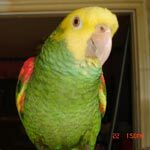 I am trying to name my new Senegal parrot and was wondering if the parrot could learn to say the name buffy or if there are other names or sounds that a parrot can say more easily. I am trying to remember if any of my parrots says a word with an 'f' in it but I can't... What I can tell you is that they seem to be able to use the letters P, T, R, K, CH, D, M, N, S, B, G, J and L without a problem. Oh, wait! I know that cockatoos and grays can because I've seen videos of cockatoos and I had a gray that could say: "F*CK YOU!" very clearly! So, there you go, yes, they can! I am amazed that they can say words with Ws and Ms.